More Guy Greetings with the sentiment here. This is probably the last card I will make using the True Gentleman Designer Series Paper. Mostly because I gave away the rest of my pieces as a prize at my Workshop this week. I love the colors and the "guy" patterns on this paper. It will be sorely missed! Notice my faux button in Early Espresso? It solves the problem of mailing a card with a button, which I've been having a lot of trouble with at the post office. The cards arrive just fine, but the clerks don't want to let them get mailed using the non-machinable stamp! So I have found a very polite post office and I simply wait in line and ask them to hand stamp my envelopes, but I have cut back on the number of those I send out. I hope you enjoyed looking today. Please let me know if you have any questions about my cards or other projects. 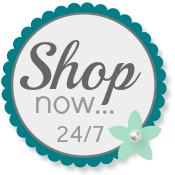 Use my Online Store when you shop for Stampin' Up! products.